PRAM DINGHY 6 - #PB 2 - On Sale! PUNT/JOHNBOAT 10 - #B 91 - On Sale! FLAT BOTTOM UTILITY SKIFF 12 - #PB 19 - On Sale! FLAT BOTTOM UTILITY SKIFF 14 - #PB 20 - On Sale! PUNT/JOHNBOAT 14 - #B 42 - On Sale! OARLING 17 - STITCH & GLUE - #DK 17 - On Sale! 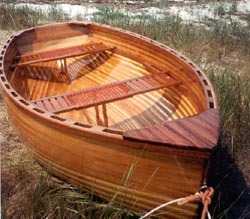 A delightful, traditional dinghy design, with fine lines and classic styling ... The hull features a wine glass transom, a hint of tumblehome in the aft sections, a gracefully curved sheerline to a clipper shaped bow with moderate flare in the bow sections. This dinghy has been designed to provide exceptional sailing and rowing characteristics and will move easily through the water leaving very little wake. Can take a small outboard up to 2 HP, long shaft. Sailing - the plans include 5 different sail rig drawings, Gaff Cat, Lugsail, Spritsail, Sloop and Sliding Gunter, centerboard or daggerboard, with dimensions and basic building instructions for the sail components. This hull has been designed for ease of construction for the home boat builder. 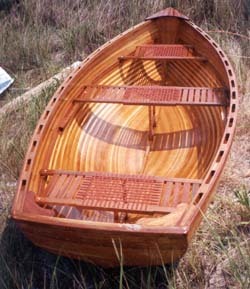 The cedar strip method of building a small craft, is an ideal method for a person with limited woodworking skills, and minimum tools, to create a beautiful, clear finished, round bottom wooden boat. Even though the hull is clear finished and gorgeous, it is still very well protected with a sheathing of Epoxy Plus and fiberglass cloth inside and out. It will require a minimal amount of maintenance and be extremely durable over the many years of use. it will be a small craft that will give you a tremendous feeling of satisfaction, not only because it is yours, but also from knowing that you have created your very own "work of art" with your own hands. A completed strip plank hull is a beautiful sight to behold and it will become one of your priceless possessions. Get started on a great winter time, or rainy day project. You'll be glad that you did! INSTRUCTIONS Full size patterns, with a 96 page illustrated construction manual. BUILDING MATERIALS - Station mold set, pre cut to the exact size shown on the full size patterns, include mahogany inner stem and marine plywood transom panel. Cedar strips, with bead & cove edges, the proper number of strips is provided. Mahogany inwales & outwales, full length, set of 4, 2 inwales and 2 outwales with machined edges, also, 2 mahogany longitudinal supports. Epoxy Plus covering kit, includes epoxy resin and fiberglass cloth to cover the interior and exterior hull. Accessories are listed in our Boatbuilding Supplies listed on this web site. NOTE - THE BEAD AND COVE STRIPS ARE ALSO AVAILABLE IN CYPRESS FOR $585. The price of the Cedar Strips includes a crating charge. MORE ABOUT CEDAR STRIP CONSTRUCTION.